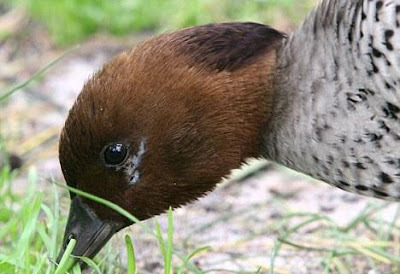 A duck had to undergo emergency surgery after surviving for several days with a 4in nail embedded in its skull. 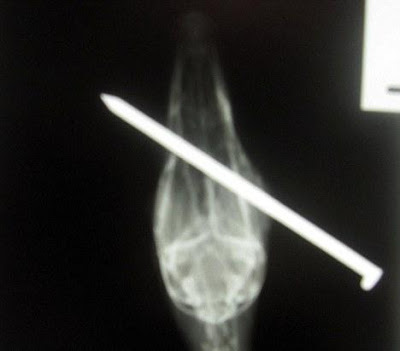 The bird, called Tully by vets, had been shot through the head with a nail gun. But it took rescuers three days to capture the creature, who had the nail sticking out from both sides of its head. 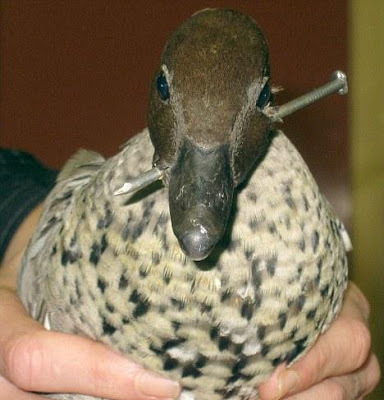 The duck was then rushed for emergency surgery at a vets in Devon Meadows, Victoria, in Australia. After giving Tully an anaesthetic, vets were able to remove the nail which had pierced his head just 4mm from an eye. Nigel Williamson, 43, from Australian Animal Rescue, was eventually able to catch him after a concerned member of the public raised the alarm. He said: 'Before trying to capture him I watched the duck to see what the situation was and he was just waddling around feeding, swimming and doing everything a duck should be doing with this nail in his head. 'He didn't seem bothered about it at all but in his healthy state it meant he was still very hard to get hold of. He blamed 'mindless yobbos' for the cruel attack. Mr Williamson added: 'We don't know who did it but we see a lot of these kind of bizarre injuries when the schools break up for holidays. It might have been kids. Tully will now spend 10 days on an antibiotics course to stop infection before being released.